If there is one thing that nags me about the smartphone of today, it is the menace that is touch typing, and the inability to have decent hardware that goes with your phone that allows you to type. Yes, there are Blackberrys (sic) but they are so far behind the curve that it is really no use trying them. And most attachments that you can buy for your phone make it bulky or heavy. 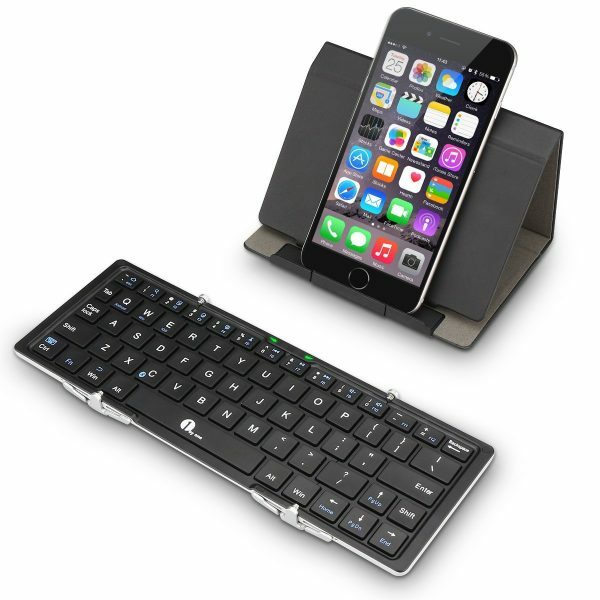 Same goes with most Bluetooth Keyboard solutions that exist in the market. You can not find ones that will fit in a pocket, though many solutions exist that will happily go inside a bag or a sleeve. 1byone seem to have a solution in their pockets (pun totally intended! 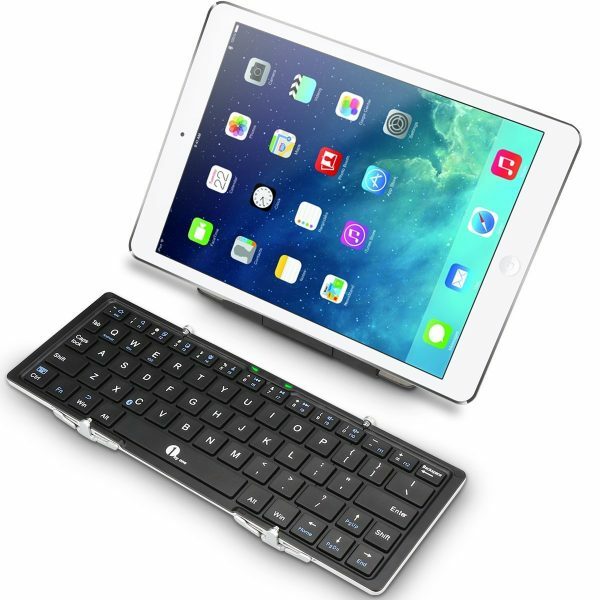 ), and that is their pocket size mini folding wireless keyboard. 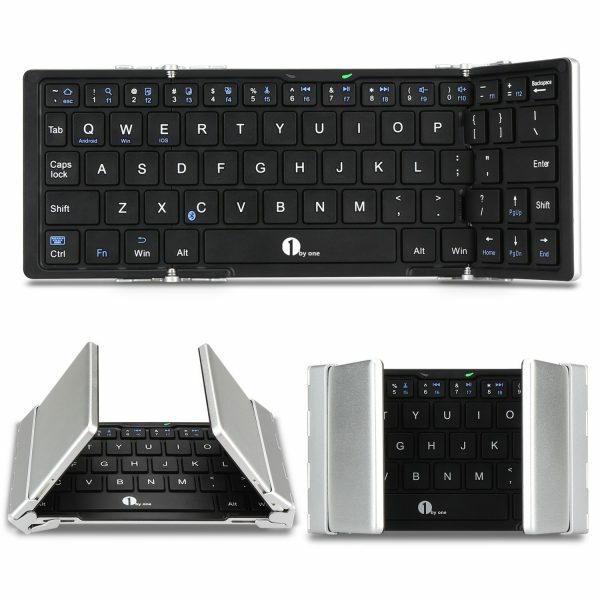 Tri-fold design makes it a perfect portable keyboard. Using the American broadcom bluetooth 3.0 chip, 8 times faster than the Bluetooth 2.0, high speed connection and signal distance up to 33ft (10m). 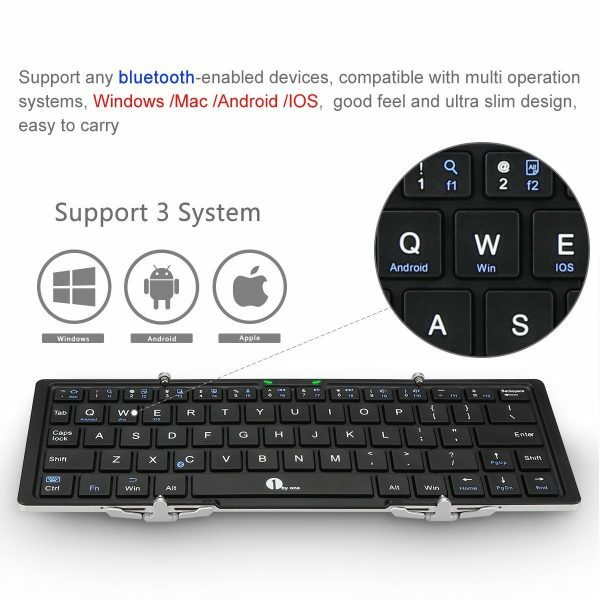 QWERTY layout with hot keys, compatible with iOS /Mac OS, Android, Windows, and all bluetooth-enabled tablets, laptops, and computers. Built-in 210mAh lithium battery, works for up to 114 days i n standby mode without charging, with 64 hours continuous use. First of all, we look at the design and feel of this. The outershell is made of aluminium, or feels like it anyway, rather than a plastic finish. A magnetic snap allows it to fold and fit in place, while undoing the same just opens it up. Closing and opening the keyboard also turns it off and on respectively, which is a handy feature. Kind of reminds me of those very old televisions, where closing the ‘curtain’ in front of it would turn it off. Kind of also shows how VERY VERY old I am. 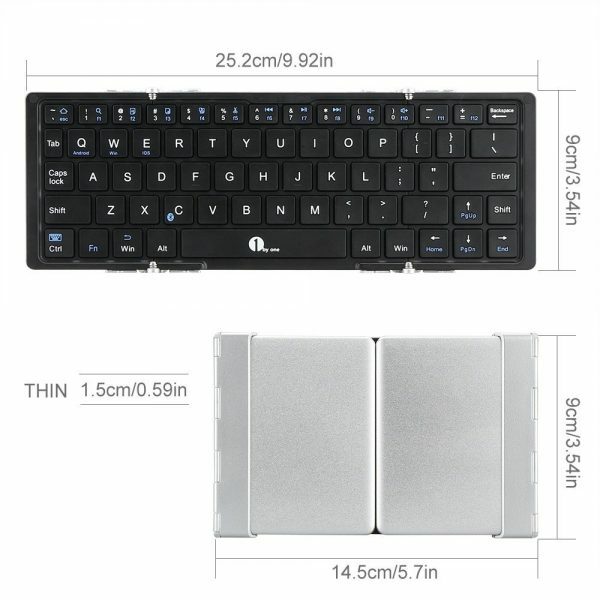 The keyboard itself is a standard QWERTY, and despite the small size, it is a normal layout, and not compact. Of course, to fit all the keys, the number keys share some of the Function key features, and so do some other keys. The layout is American/US, just so you know. The keys around are the alphabets are compact, and save space, much like most portable keyboards or even the ones on the smaller laptops. This includes the Tab key and the right Shift key. Overall though, once you get used to it, it is all okay. The feeling of the key is a tricky one for people like me who type a lot. Tricky because you get the best feel from a keyboard when the keys can be pressed all the way. However, the thinner the keyboard, the less give there is. 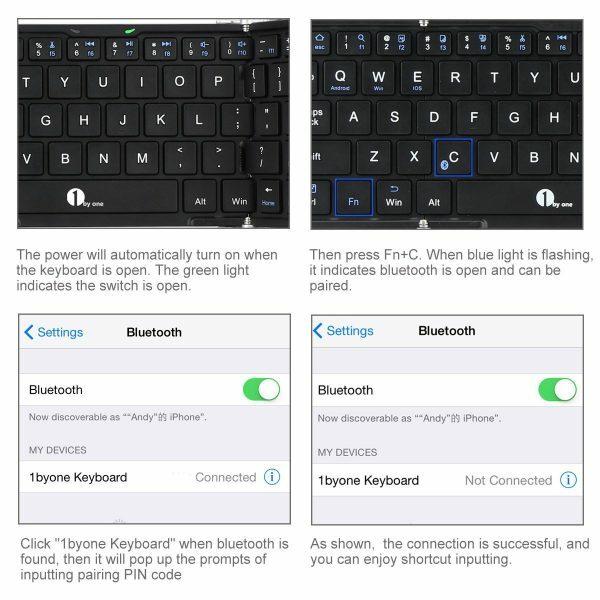 The keyboard definitely has that, even though there is enough of a tactile feel to let you know that you have pressed the keys. Another thing to notice is that because of the small dimensions, if you use it with ‘hard hands’, or are focused on one side of the keyboard, it may feel a little unstable, as in may tilt to one side or the other. Once again, another thing you will get used to, and move on from. At the size of a smart phone, although just a tad thicker, this is highly portable. The fact that it can last an extremely long time on battery life also means that you do not need to carry charging cables around, and if it does run out, a simple micro USB will charge it. Obviously, if your pockets are full, you will find that it stores really well in any kind of bag too, but just the simple fact that it can be carried around in a pocket is a big win. More information on the product can be found on the product page at Amazon. It generally retails for $116.99, but has 70% off right now to give you a price of $34.99. Call me weird, but I love a good keyboard. This one ticks a lot of boxes, and comes at a decent price in the current sale too. Previous story Responsible Gambling – is it possible? Next story Honor 6 to get Android 5.1 and EMUI 3.1!